Having a new wood floor installed in your home (or tackling DIY flooring installation yourself) is an exciting opportunity to customize a special room or area of the house that could use a makeover. Both sturdy and beautiful, wood is one of nature’s best materials. When you’re considering adding a gorgeous wood floor to one or more of your rooms, ponder the following points. Then you’ll be ready to make an informed final decision about the wood type and composition of your new floor(s). Hardwood comes from deciduous trees -- species that lose their leaves in the fall. The wood is cut into planks, which are usually between 2 1/4" and 6" wide, in lengths ranging from 1-8 feet. To install hardwood floors, these planks are carefully nailed in place on top of a subfloor. Hardwood floors are prized for their elegance, comfort, and long life. While imported hardwoods are uniquely attractive, their higher cost may be a significant limiting factor for some homeowners. After the wood has been harvested for use in flooring, it is subjected to one of various types of processing, commonly solid wood or engineered wood. Solid wood flooring is simply cut from whole trees and is available in wood planks (regular or stylish wide plank style), strips, and parquet squares. Pre-finished (AKA factory-finished) hardwood flooring comes to you with a finish coat already applied. With unfinished hardwood, your flooring contractor will apply the finish after installation is complete. Finishes range from rustic to high shine. Engineered wood flooring differs from solid hardwood flooring mainly in that engineered wood is manufactured by combining several layers of wood, each with the grain running in the opposite direction to the layer below. This engineering process makes the final product very sturdy and more resistant to damage caused by foot traffic. Due to its unique construction, engineered wood is also less likely to be damaged by exposure to heat or cold, or extreme temperature changes, since it will expand and contract less than solid wood. 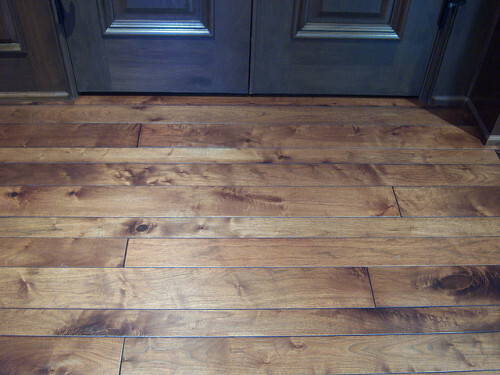 Engineered flooring are topped with a veneer layer, featuring one, two, or three-strip planks. Engineered flooring tends to be very popular among fans of do-it-yourself home improvement, due to the relative ease of DIY installation. No matter how many planks the veneer layer may contain, pre-cut engineered flooring pieces can simply be “snapped” together before they are laid over a room’s subfloor and an underlayment of foam rubber. For professional installation of your new wood floors, contact a trusted flooring contractor.